The CPDSA and the USA share the 4th of July as a symbol of independence and freedom. 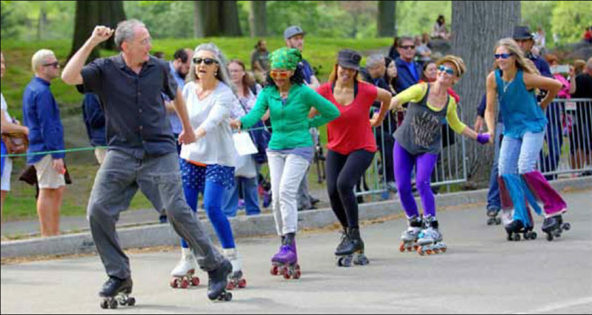 For us, the 4th was the first trial day when we were allowed to play music for our skaters in the park after three months of being silenced by Mayor Guiliani. Negotiating an agreement with the Parks Department had been a lengthy process. Between April and July, we were not allowed to play amplified music during our skate sessions. In order to keep the Circle rolling and keep the skaters showing up, Stu Popovitz — one of our skaters who is an electronics engineer — built a small portable FM transmitter for us to broadcast our music at 87.9 FM. Jay Stewart was our DJ on the day of our first Broadcast.